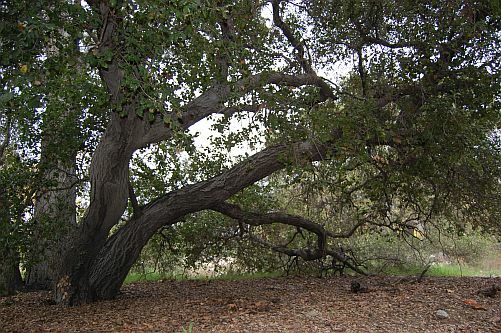 I stood dwarfed by towering coast live oaks and sycamores in an Arcadia woodland wonderland marked for destruction by the county Department of Public Works and Flood Control. An older woman wearing sunglasses stopped to talk to me. “This is a great place to walk because it is flat,” she volunteered. I didn’t say anything because I realized she was right. And because I hadn’t thought of it that way. “Yeah. My wife won’t hike with me in the mountains because the trails are too steep,” I told her. The woman saw things that the county engineers, Board of Supervisors, EIR writers and bureaucrats had missed. The bigger picture. It is a special feeling being able to walk amid trees, birds and salamanders. Especially when you’re 85. Hiking up the Mount Wilson Trail or Mount Baldy is often for the experts, or the very in-shape. All nature preserves should be thought of as part of a big picture, as many parts of one whole. “You would never know there are so many people living around here,” she said later on in the walk. Again, she had something that we all missed. Saving trees is not the point. Saving a habitat is. It is the whole — or in this case an 11-acre stand which connects to the larger significant ecological area that extends to Altadena — that matters. When the people who founded Chino Hills State Park called me to tell me they were upset about a proposed housing project for the ridgeline, I didn’t get it. “It’s better if the park guest can’t see houses, roofs, from inside the park. It is supposed to feel like being surrounded by nature,” someone explained to me. Greedy? Maybe. But greedy for trees and birds. I remember in the 1980s when I was working at the Orange County Register and a group fought to save the Newland House in Huntington Beach. I always considered it a hollow victory because, although the house was saved, the area around it was not. It is surrounded by a shopping center and a supermarket. On both ends of the 11-acre stand in Arcadia are sediment dumps. Trucks pile up dirt removed from mountain dams. The reservoirs must hold water or risk flooding the neighborhoods. I realize it is an important part of the flood control task performed well by the county. In between is the stand of trees and a carved out dirt road. The county wants to split the acreage by “saving” the lower half and cutting down most of the oaks and sycamores from the top half. Cutting down trees that are between 100 and 170 years old to dump dirt and sediment is not holistic thinking. In fact, it’s just plain dumb. Yet, to engineers tasked to solve a particular problem, it makes sense. They’re not looking at the whole. Saying the lower half is saved is technically true, but not really. A raised conveyor belt humming along the forest with dirt and rocks will disrupt the nature experience of the average person out for a stroll. Just as the entrance to San Gabriel Canyon in Azusa is disrupted by the electronic buzz of mining machines and miles of conveyor belts and the occasional blasting from the mountain mining operation. It’s the first thing riders on the river bike paths notice. It’s not “nature” until you ascend beyond the mining dust and the last tract home and see only trees. But not everyone can climb that high. Thank you Andrew W for sending me this link (see video above). In it, he explains 2020b.com’s innovative projects in urban housing/architecture, school buildings and effecient/clean energy. HOPE that our best and brightest would be back on a track to save the world began to spring eternal after the financial collapse of late 2008. With Wall Street guys in Brooks Brothers suits getting pink slips, young turks graduating from top MBA schools re-directed into teaching, nonprofits, even manufacturing. Now that the financial industry is back on its feet and the smell of bonus checks very much in the air, the future Masters of the Universe are flocking to Wall Street faster than you can say “TARP bailout.” Credit the adroit reporting of Daniel Gross of Yahoo Finance, who recently reported that 34 percent of Harvard Business School’s Class of 2010 are taking financial services jobs. That not quite as bad as 41 percent from the Class of 2008, right before the crash. There is something very wrong with our country’s human capital if its primary goal is earning $1 million before age 30 or a yacht by 35. Plus, these brightest and best are doing it through sleight-of-hand management techniques at hedge funds and investment houses, and by inventing casino-like financial instruments that make them rich but turn hardworking homeowners poor. What good is it for our country to boast the best universities in the world if this is the result? This is not innovation. It’s manipulation, resulting in a richer upper class and a lot of unemployed middle class. Meanwhile, the problems of a trade deficit and a receding manufacturing base, soaring gasoline prices and pending environmental damage remain. On Thanksgiving Day, I excitedly asked my wife’s younger cousin about electric cars, namely the new Nissan Leaf and Chevy Volt, both being sold to the public this month. “Ah, they are a waste. A big waste,” he said, proceeding to tell me the challenges of creating an on-road infrastructure of electric charging stations. He said these cars would never succeed without automatic electric charging from beneath Southern California’s freeways. “Why don’t you invent that?” I said, half-jokingly. I’m seriously concerned about the lack of innovation coming from our college students. If they are as pessimistic as my wife’s young cousin about advancements in electric cars, or only focused on selfish pursuits as those Harvard MBAs, we are in big trouble. Schools should be where our next inventors come from. Unfortunately, both Bill Gates of Microsoft and Mark Zuckerberg, creator of Facebook, the social media site, were Harvard dropouts. Had they stayed I might be still punching this out on a typewriter instead of a computer. But don’t misunderstand. The social networking advances are not so revolutionary. So a lonely Zuckerberg produced a software where people can hide behind a screen and “friend” someone without ever speaking to them, seeing them or touching them? That’s not innovation, it’s isolation. Is it really innovative, as T-Mobile 4G smart phone ads say, to brag “you can video chat without needing Wi-Fi?” I mean, how many people video chat? Or want to. I don’t. Instead, we need people inventing new kinds of food that don’t make us so fat. Or energy alternatives that release us from our dependence on foreign oil. I’d settle for a new ethics directive from Harvard and every other business school, condemning the invention of financial trickery. Or a mission statement that encourages graduates to aid small business and American manufacturers. I learned about Cal State Fullerton’s Mihaylo School of Business educating hotels on how to be greener and teaching “soft skills” that improve management practices and increase understanding in multicultural L.A. and I felt a little better. I want to see college kids graduate and become the next Alan Cocconi, the man who founded AC Propulsion in San Dimas, which helped build BMW’s Mini E electric prototype. Without innovation from the next generation, our country is dead in the water. It was with these thoughts swimming in my head that I gave the man at the Nissan Leaf display at the L.A. Auto Show my name and e-mail so he could put me on the waiting list. I want to be part of the solution.